Entering Game 1, the main X-factor for the series was how the Penguins hadn't faced a defense as deep as what the Sharks possessed. Entering Game 2, that's quickly shifted to how San Jose hasn't faced a team with the type of speed Pittsburgh possesses. The Pens won the game 3-2, but despite the close score there were stretches of dominance for both teams. 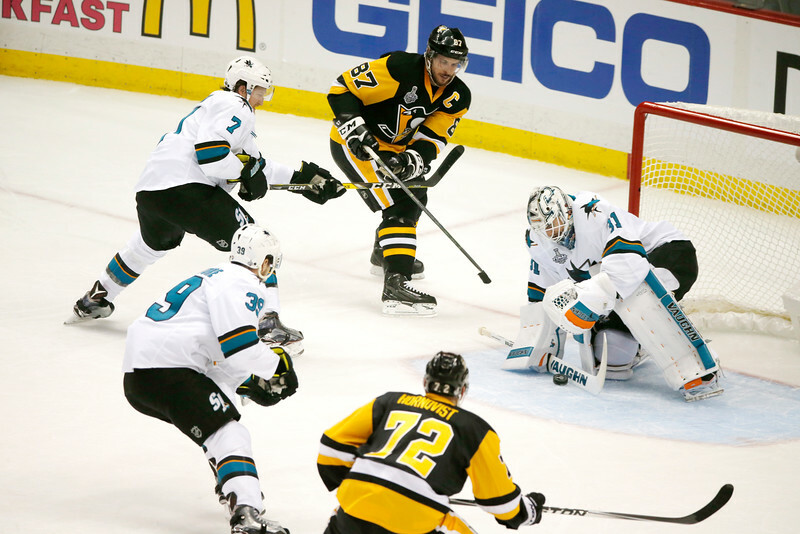 Pittsburgh came out of the gate flying, scoring 2 goals in the 1st period while controlling the gameplay before the Sharks were able to respond in kind in the 2nd period, adding two goals of their own while driving the play back into the Penguin defensive zone. If anything, what Game 1 did was reinforce the belief that this was going to be a long, competitive series between the two teams, and fun, entertaining hockey to watch at that. While the goal total (5) wasn't a particularly high number, the rushes and the chances created during the game were a refreshing display of skill and risk taking that haven't always been on display in the Finals. One area where the Pens looked to have a bigger advantage than in previous rounds was in the opposition's net. Pittsburgh went through a tough gauntlet of goalies to reach the Stanley Cup Finals, first against Henrik Lundqvist before facing the Vezina Trophy favorite in Braden Holtby. And while they managed to dodge fellow Vezina finalist Ben Bishop due to a freak injury in the Eastern Conference Finals, backup Andrei Vasilevskiy nearly stole the series for the Lightning with his strong play. Martin Jones isn't a bad goalie, but he certainly doesn't have the talent or pedigree of the other netminders. And while the Pens were able to direct 41 shots on goal, Jones stopped 38 of them for a 0.927 SV%. If he's able to be a force in net, Jones is going to be a big help to the Sharks as the look to rebound from Game 1. Likewise, if the Penguins are able to continue generating that much offense, they should expect to break through on Jones over the course of the series. - Bryan Rust will be a gametime decision after taking a high hit from Patrick Marleau in Game 1, though he did practice with the team at the morning skate. - Bryan Rust and Conor Sheary notched the first two goals of the Stanley Cup Finals, marking the first time since 1924 that the first two goals were scored by a rookie.